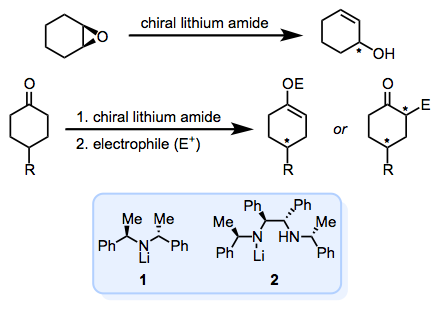 Asymmetric deprotonation using chiral lithium amides refers to the selective removal of one of two enantiotopic protons by a chiral lithium amide base. Transformations of the resulting chiral anions lead to chiral, enantioenriched products. Chiral lithium amides may be used to effect the selective removal of one of two enantioselective protons in prochiral substrates. In the vast majority of cases, high enantioselection depends on the presence of a coordinating heteroatom in the prochiral substrate. Coordination between lithium and the heteroatom brings the chiral base and substrate into close proximity and enforces the removal of a particular proton. In practice, chiral lithium amide bases are most commonly used for base-mediated rearrangements of epoxides to allylic alcohols, enolizations of ketones, and functionalizations at either aromatic or benzylic positions of tricarbonyl(arene)chromium complexes. After deprotonation by the chiral base, treatment with an electrophile yields a chiral, functionalized product (Eq. 1). Although the scope of these reactions is somewhat limited by the necessary presence of strong base in the reaction medium, asymmetric transformations employing chiral lithium amides have been applied to the synthesis of many chiral natural products. Deprotonation at the β-carbon of epoxides affords allylic alcohols after β-elimination (Eq. 2). Coordination between the epoxide oxygen and lithium results in the selective removal of the protons syn to the epoxide oxygen; nonbonding interactions between the base and the substrate enforce the selective removal of one of the two enantiotopic syn protons. Dibasic reagents, which contain both a lithium amide and lithium alkoxide, react more rapidly in these reactions than lithium amides (Eq. 6, below). A mechanism involving simultaneous coordination of the lithium amide to the epoxide oxygen and deprotonation by the pendant alkoxide has been proposed to explain this observation. Aggregation of lithium amides may complicate mechanistic studies of these reagents (Eq. 3). Often, additives such as hexamethylphosphoramide (HMPA) and lithium chloride are used to break up lithium aggregates, encouraging the formation of more reactive monomeric species. A stoichiometric amount of an achiral base may be employed in conjunction with a catalytic amount of chiral lithium amide in reactions of epoxides and other substrates (Eq. 7, below). In these reactions, the rates of deprotonation by the chiral base and regeneration of the chiral lithium amide from its conjugate acid must be significantly faster than background deprotonation by the achiral base. The conformationally biased ketone 4-tert-butylcyclohexanone has emerged as an attractive substrate for studies of the enantioselective enolization of ketones. A stereoelectronic bias exists for removal of the axial α-protons. As in reactions of epoxides, coordination of lithium to oxygen is a critical aspect of the mechanisms of these reactions. It has been proposed that lithium chloride both helps break up aggregates of lithium amides and participates in the deprotonation event (Eq. 4). The resulting lithium enolates are often quenched using silyl chloride electrophiles. An internal quench procedure involving simultaneous addition of the amide and silyl chloride results in higher enantioselectivities than addition of the base followed by the silyl chloride. This outcome likely results from the generation of lithium chloride in situ as the reaction proceeds. Coordination of the (tricarbonyl)chromium fragment to an aromatic π system in an η6-fashion acidifies aromatic and benzylic protons in the organic ligand. When the coordinated arene possesses heterotopic protons in the benzylic position(s) or ortho to a directing group, chiral lithium amide bases may be used to remove one of the heterotopic protons selectively (Eq. 5). Lithium chloride, either added externally or generated in situ by quenching with a silyl chloride, is essential for high enantioselectivity in these reactions. In the absence of lithium chloride, the resulting benzyllithium or aryllithium nucleophiles react rapidly with starting material without stereocontrol. A study employing n0butyllithium followed by treatment with a chiral amine and silyl chloride supports a mechanism involving enantioselective deprotonation at the benzylic position, rather than selective quenching of one enantiomer of a racemic benzyllithium reagent controlled by the chiral amide. Provided the substrate is not sensitive to strong base and contains an appropriately positioned coordinating group, the scope of reactions of chiral lithium amides is quite wide. This section covers each of the three major reactions for which chiral lithium amides are applied. Aliphatic epoxides undergo rearrangement to allylic alcohols in the presence of strong base. Dilithiated amino alcohols, particularly those derived from norephedrine, are exceptional reagents for these reactions (Eq. 6). Catalytic amounts of the chiral lithium amide may be employed along with a stoichiometric amount of achiral base. Lithium di(isopropyl)amide (LDA) is commonly employed as the achiral base in these reactions, although an excess of 1,8-diazabicycloundec-7-ene (DBU) is often required to achieve high enantioselectivities (Eq. 7). Rapid background deprotonation by achiral LDA can be an issue in the absence of DBU. Lithium enolates of ketones produced through the action of chiral lithium amides on prochiral ketones are commonly quenched with a silyl chloride. The resulting chiral silyl enol ethers may then be subjected to oxidation or functionalization in a separate step. 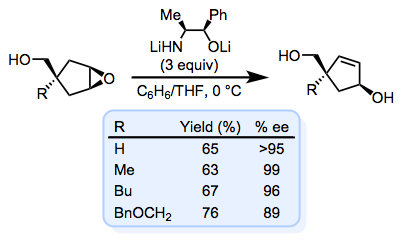 For example, a chiral silyl enol ether was subjected to Saegusa-Ito oxidation followed by treatment with a cuprate to yield a chiral cyclohexanone derivative in high yield and enantiomeric excess (Eq. 8). 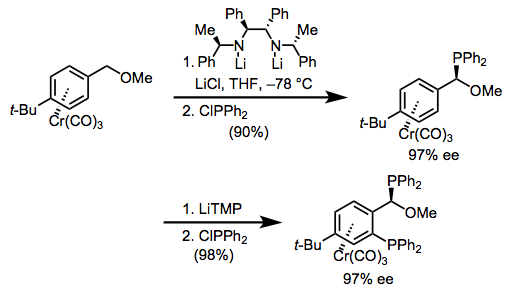 Chiral lithium amides have been applied for the desymmetrization of meso bicyclic ketones capable of undergoing ring opening. Upon treatment with Lewis acid, β-elimination occurs to yield a ring-opened, chiral enone (Eq. 9). Direct functionalization of the lithium enolate that results from treatment with a chiral lithium amide is also possible. Acylation and Mannich reactions are known, as well as diastereoselective aldol reactions with aldehydes (Eq. 10). Chiral lithium amides have been applied for both ortho-lithiation and benzylic functionalization of cobalt-coordinated arenes. In particular, these reactions are useful for the synthesis of enantiomerically enriched phosphine ligands for organometallic catalysis. Chelating phosphines may be synthesized using a benzylic functionalization/ortho-lithiation strategy (Eq. 11). Chiral lithium amides are useful for kinetic resolution reactions in addition to desymmetrizations. In these reactions, one enantiomer of a racemic mixture reacts more rapidly with the chiral amide base than the other enantiomer. For example, benzylic functionalization may be achieved with kinetic resolution of racemic tricarbonyl(arene)chromium complexes (Eq. 12). 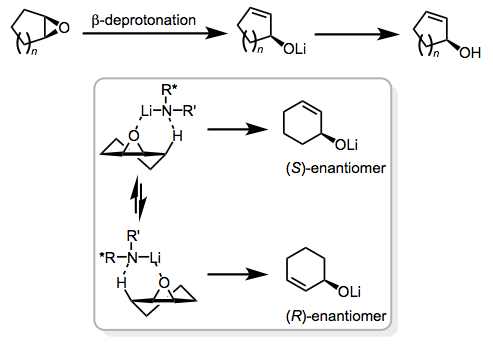 Enantioselective deprotonations are typically employed in the early stages of synthesis, when starting materials are unlikely to be sensitive to base. Despite the requirement of strong base in these reactions, chiral lithium amides have been employed in a variety of syntheses of natural products, to set the configurations of stereocenters at an early stage. 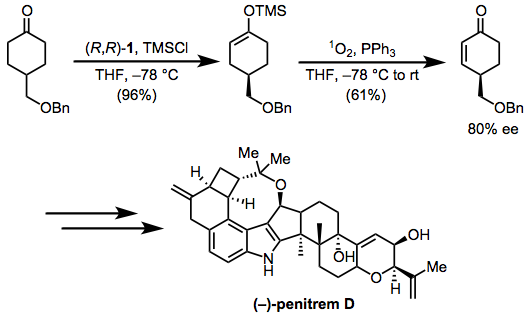 For example, desymmetrization of a prochiral ketone was employed very early in the synthesis of (–)-penitrem D (Eq. 13). Subsequent oxidation of the resulting silyl enol ether afforded a chiral enone. Because lithium amides are strongly basic, they can often effect the removal of otherwise stubborn protons, such as those positioned at bridgehead carbons. 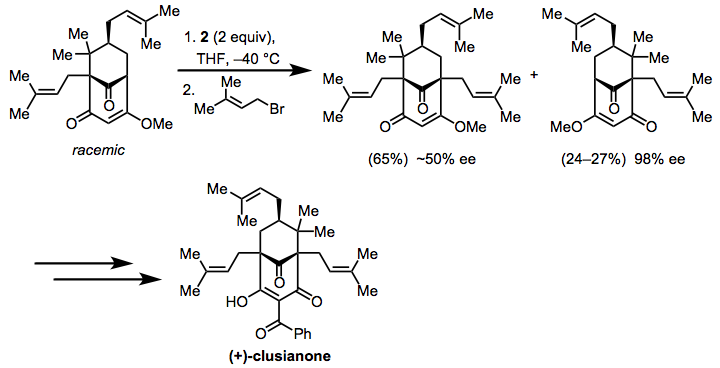 This idea was applied to a kinetic resolution in the synthesis of (+)-clusianone (Eq. 13). Treatment of racemic starting material with chiral lithium amide and quenching with prenyl bromide permitted the separation of the enantioenriched, unfunctionalized product from the essentially racemic functionalized product. The former was carried on to (+)-clusianone. A number of alternative reagents for enantioselective deprotonation and functionalization are known. For example, chiral magnesium diamides have emerged as alternatives to lithium amides. Either HMPA or DMPU is required as an additive in these reactions, but both yields and enantioselectivities are high (Eq. 15). Organocatalytic desymmetrization methods provide a second alternative to the use of lithium amides, although the scope of these reactions is currently more limited than reactions of lithium amides. In Eq. 16, the formation of a complex between L-proline and the chiral thiourea catalyst is critical both for enantioselectivity and proline solubility. Enzymes often exhibit extremely high enantioselectivity; however, enzymes suffer from great specificity and limited application to a broad range of substrates. Nonetheless, a number of enzymes have been used successfully for desymmetrization and kinetic resolution. Pseudomonas fluorescens lipase (PFL) is one such enzyme (Eq. 17). Some chiral amine precursors are commercially available; however, it is common to prepare the chiral amine from simpler starting materials. Recent reviews have addressed the state of the art of the synthesis of chiral amines. Common starting materials for the synthesis of chiral amines precursors include proline, phenylglycine, norephedrine, α-methylbenzylamine, and chelating diamines. Nearly without exception, chiral lithium amides are prepared by treatment of the corresponding chiral amine with n-butyllithium in a dry, aprotic solvent. Reactions are typically carried out below 0 °C, although the reaction mixture may be warmed to room temperature to ensure complete formation of the lithium amide. A solution of the substrate is typically transferred via syringe or cannula into a cold reaction vessel containing the lithium amide and other additives (such as lithium chloride). The solution of base may be added slowly to the substrate (inverse addition) if the substrate is sensitive to base. Under an argon atmosphere, n-butyllithium (0.93 mL of a 1.61 M solution in hexane, 1.50 mmol) was added to a solution of (R)-N-neopentyl-1-phenyl-2-(1’-piperidino)ethylamine (432 mg, 1.58 mmol) in THF (18 mL) at rt, and the whole was stirred at –78 °C for 5 min. A solution of 4-tert-butylcyclohexanone (194 mg, 1.25 mmol) and TMSCl (0.79 mL, 6.3 mmol) in THF (2 mL) was added during 90 s, and the whole was stirred at –78 °C for 10 min. After addition of Et3N (2 mL) and sat. aq NaHCO3 (6 mL), the reaction mixture was allowed to warm to rt, and was extracted with hexane (200 mL in total). The organic extract was washed successively with 0.1 M aq citric acid (5 x 50 mL, until the pH of the aqueous washings was nearly 4), H2O (20 mL), sat. aq NaHCO3 (20 mL), and brine (20 mL), and then dried (Na2SO4). Evaporation of the solvent gave a pale yellow oil, which was purified by column chromatography (hexane) followed by bulb-to- bulb distillation to give (R)-tert-butyl-1-trimethylsilyloxycyclohex-1-ene (244 mg, 86%, 84% ee) as a colorless oil: bp 160 °C (5 mmHg); [α]36525 +198.5 (c = 1.01, benzene) (lit. [α]36525 +237 (benzene) for the maximum rotation); IR 3040, 2960, 2870, 1675 cm–1; 1H NMR (250 MHz, CDCl3) δ 4.84 (m, 1H), 2.25–1.95 (m, 3H), 1.88–1.73 (m, 2H), 1.34–1.12 (m, 2H), 0.87 (s, 9H), 0.18 (s, 9H); 13C NMR (63 MHz, CDCl3) δ 150.4, 104.1, 44.1, 32.2, 31.1, 27.5, 25.2, 24.5, 0.44; LRMS m/z: 226.2 (M+), 211.2 ([M – Me]+), 169.1, 142.1, 127.1; HRMS m/z: M+ calcd for C13H26OSi, 226.1753: found, 226.1752. An enantiomeric excess of 84% was determined by comparison of the specific rotations. ↑ Hodgson, D. M.; Gibbs, A. R.; Lee, G. P. Tetrahedron 1996, 52, 14361. ↑ Mordini, A.; Rayana, E. B.; Margot, C.; Schlosser, M. Tetrahedron 1990, 46, 2401. ↑ Sato, D.; Kawasaki, H.; Shimada, I.; Arata, Y.; Okamura, K.; Date, T.; Koga, K. J. Am. Chem. Soc. 1992, 114, 761. ↑ Pettersen, D.; Amedjkouh, M.; Lill, S. O. N.; Ahlberg, P. J. Chem. Soc. Perkin Trans. 2 2002, 1397. ↑ Toriyama, M.; Sugasawa, K.; Shindo, M.; Tokutake, N.; Koga, K. Tetrahedron Lett. 1997, 38, 567. ↑ Corey, E. J.; Gross, A. W. Tetrahedron Lett. 1984, 25, 495. ↑ Ariffin, A.; Blake, A. J.; Li, W. S.; Simpkins, N. S. Synlett 1997, 1453. ↑ Schellhaas, K.; Schmalz, H. G.; Bats, J. W. Chem. Eur. J. 1998, 4, 57. ↑ Gibson, S. E.; O'Brien, P.; Rahimian, E.; Smith, M. H. J. Chem. Soc. Perkin Trans. 1 1999, 909. ↑ Hodgson, D. M.; Gibbs, A. R. Tetrahedron: Asymmetry 1996, 7, 407. ↑ Bertilsson, S. K.; Södergren, M. J.; Andersson, P. G. J. Org. Chem. 2002, 67, 1567. ↑ Shirai, R.; Tanaka, M.; Koga, K. J. Am. Chem. Soc. 1986, 108, 543. ↑ Bunn, B. J.; Cox, P. J.; Simpkins, N. S. Tetrahedron 1993, 49, 207. ↑ Lee, J. C.; Lee, K.; Cha, J. K. J. Org. Chem. 2000, 65, 4773. ↑ Gibson, S. E.; Ibrahim, H.; Pasquier, C.; Steed, J. W. Tetrahedron 2002, 58, 4617. ↑ Castaldi, M. P.; Gibson, S. E.; White, A. J. P. Eur. J. Org. Chem. 2006, 1867. ↑ Smith, A. B.; Nolen, E. G.; Shirai, R.; Blase, F. R.; Ohta, M.; Chida, N.; Hartz, R. A.; Fitch, D. M.; Clark, W. M.; Sprengeler, P. A. J. Org. Chem. 1995, 60, 7837. ↑ Rodeschini, V.; Simpkins, N. S.; Wilson, C. J. Org. Chem. 2007, 72, 4265. ↑ Henderson, K. W.; Kerr, W. J.; Moir, J. H. Tetrahedron 2002, 58, 4573. ↑ Valero, G.; Companyó, X.; Bravo, N.; Alba, A. N. R.; Moyano, A.; Rios, R. Synlett 2010, 1883. ↑ Carnell, A. J. J. Mol. Cat. B: Enzymatic 2002, 19, 83. ↑ Nugent, T. C.; El-Shazly, M. Adv. Synth. & Cat. 2010, 352, 753. ↑ Padwa, A.; Curtis, E. A.; Sandanayaka, V. P. J. Org. Chem. 1996, 61, 73. This page was last modified on 5 September 2013, at 03:10.